The Régiment de Guyenne was a French Army infantry regiment in the 18th century. It is principally known for its role in the Seven Years' War, when it served in the North American theatre. The 3rd Dragoon Regiment (3e régiment de dragons or 3e RD) was a cavalry regiment in the French Army, it was active in various forms from 1649 to 1997. The 6th Dragoon Regiment (French: 6e Régiment de Dragons, 6e RD) was a cavalry Regiment of the French Army. It was active from 1673 to 1992. The 5th Hussar Regiment (5e régiment de hussards or 5e RH) was a French Hussar regiment. The Régiment de Béarn was a French Army regiment active in the 18th century. It is principally known for its role in the Seven Years' War, when it served in the North American theatre. The 54th Infantry Regiment (54e régiment d’infanterie or 54e RI) is a line infantry regiment of the French Army. 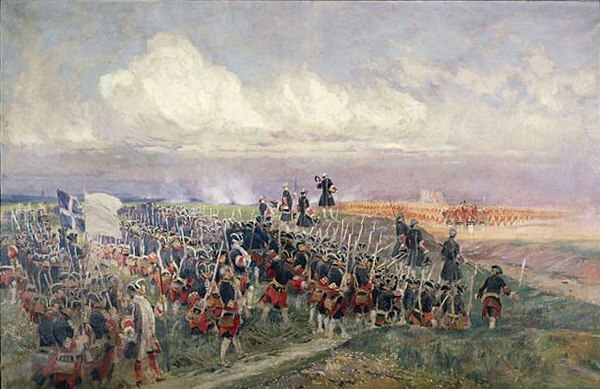 Founded in 1625, the Régiment de Touraine was a French infantry regiment raised in the province of Touraine. The Régiment de Berry was a French Army regiment active in the 18th century. It is principally known for its role in the Seven Years' War, when it served in the North American theatre. This is a list of French units in the American Revolutionary War. The Régiment de Languedoc was a French Army regiment active in the 18th century. It is principally known for its role in the Seven Years' War, when it served in the North American theatre.